Concurrent with the 21st INU Council meeting and in anticipation of the 2016 Global Citizenship and Peace programs at Hiroshima University, Dr. Catherine Kevin and Dr. Anthony Langlois, the co-chairs of the Academic Planning Committee, organized a seminar titled Indigenous Rights in Global Context: An Australian Perspective. The INU Council meeting delegates, along with Flinders University’s faculty, staff, and students, attended the seminar. 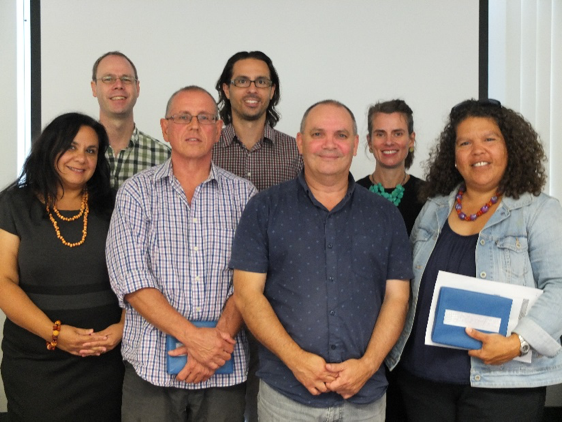 Flinders University’s scholars with expertise in the fields of indigenous language, culture, history, and politics discussed their research and current political engagements to help delegates situate indigenous rights in the global context in preparation for the 2016 Global Citizenship and Peace programs. The first two speakers, Karina Lester and Simone Tur, shared their expertise in the historical and ongoing relationships between nuclear testing and waste and indigenous Australians, a topic relevant in the context of the memorializing of the nuclear bombing of Hiroshima, a core of the programs at Hiroshima. Next, Daryle Rigney and Steve Hemming spoke about inter-nation partnerships that are working toward the repatriation of indigenous peoples, particularly in terms of restoring healthy communities in the wake of colonial violence. They also described the historical processes that have led to inter-nation agreements and considered the future direction of these partnerships. A 2015 alum of the INU Master’s Summer School for Global Citizenship and Peace and a workshop presenter for 2016 program, Roland Wilson, offered his reflections about the significance of the program for him personally and professionally, highlighting the importance of considering the impact of nuclear energy today. The delegates found the seminar to be very informative and helpful in promoting the program to the students at their institutions.